Ethel Lina White, born in 1876, was a Welsh novelist who specialized in crime stories and suspense thrillers. Perhaps best remembered today for the novels Some Must Watch and The Wheel Spins, White passed away in 1944, at the age of 68. CLICK HERE FOR MORE STORIES BY ETHEL LINA WHITE. There is a word that film buffs like to use to describe a type of motion picture that, because of its tautness and high suspense quotient, almost seems as if it had been directed by the so-called “Master of Suspense” himself, Alfred Hitchcock. The word, naturally enough, is “Hitchcockian,” a term that might be fairly applied to such wonderful entertainments as Gaslight (both the 1940 and ’44 versions), Charade, The Prize and Arabesque. 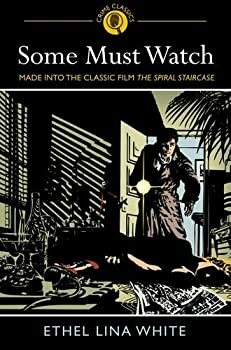 But of all the pictures that have been honored with the adjective “Hitchcockian” over the years, none, it seems to me, is more deserving than the 1946 RKO film The Spiral Staircase, and indeed, after 40 years’ worth of repeated watches, I have come to deem the picture the greatest horror outing of the 1940s … at least, that wasn’t a product of Universal Studios or producer Val Lewton.